I welcome rain. The cleanse, the built-in excuse to rent a movie. The sound of it, the smell. The green of grass after the film of dry days has been rinsed. I love obtrusive weather, in fact - when it's destructive and interesting. High winds, rain, snowstorms, hurricanes. The aftermath, the mess - changes to the landscape, alterations to expectations - sad -yes- and also fascinating. This sense of control we have, this false security - these plans we continue to make - outside. Knowing, as we do, that Weather might come and render those plans null, irrelevant. Storms this week in Atlanta. Nonsensical storms, rain for days. Flooding. Ponds and lakes and rivers where there were puddles and gutters and trenches. Schools closed, businesses claimed. The flooding at once terrible but, again, interesting. I was afforded the luxury of watching it from a removed place - where the only affect on me is some mildly stir-crazy kids, a wet and confused cat, and some driving detours. Until Agatha called today. Godmother to my first, Agatha is a motivator. She calls others to action. Through tears she told me that another friend, Dee, had her basement wall collapse yesterday. No flooding per se, but saturated ground that couldn't take it, a wall that couldn't take it, and suddenly her basement was rubble and georgia clay. Dee quilts. I know her from years ago when I would do Habitat with some regularity - I was single and could offset my selfishness and mild debauchery with committed Saturdays with reliable friends and paint, hammers, laughter, and a little sweat. Dee was close to our chosen house leader, the one professional on the crew. Through this connection, I knew her peripherally. I tried to know her better when several of my Habitat friends started spending their after-Habitat time quilting. I wanted to join them, and after asking many times, in various ways, finally figured out they didn't want me at their bee. I was a little wounded. They were an inclusive group, but they had their reasons. I thought I could quilt. I wanted to try. I was pregnant, and worried a little that if I didn't learn then, I may not get a chance. Then, at the baby shower for my first born, the Habitat friends and quilters presented me with - a quilt. They had been working for my baby. A big, beautiful twin+ sized quilt. Too big for a crib. In watermelon and apple green and yellow - the colors of my nursery in our then loft. I was touched, and stunned, that people, some of whom I only knew tangentially, would make this for me. For my baby - not yet arrived. I learned, much later, that Dee had joined "the quilting aunties" (as I referenced them to my toddler son, during prayers, under that same quilt) when she lost her son. The quilting became her therapy. Her tears, I thought, strengthened the threads, ensured that love worked all the way into the batting. Flash ahead ten years: Agatha's call today was that, in the disaster that was the collapse of the basement wall, rubble claimed many of Dee's grandmother's quilts. Quilts that were now sopping wet and tinged clay-orange. Dee needed to find, she said, a laundromat with front loaders, to try to salvage them. To get them rinsed and spun out and air dried and rid of clay and water. Not yet home, I turned my car around. I drove to Dee's. I took the bags of quilts. I went home. And I washed them (on delicate, in my front-loading washer) all day. As each one (12 of them) came out of the dryer (on air dry) I touched them. I laid them out. I felt the piecework, and the stitches on top. The patterns of color, of shape, and then the shadow patterns on top - geometric and organic, colorful and white, patterned and solid. Quilts of many sizes. I laid one, fresh from the dryer, on pPod, at nap time. Each quilt made by someone for someone. Each one stitched with love, with thought. Over the course of year, or two. While babies were born and grown ups died. Prayers and laughter and tears worked into the fabric. Each one. Decades ago, all of them. Picnics had been eaten on these quilts. Love made, tears dried, babies warmed. Wrapped around some small person's shoulders to be capes. Draped over chairs as forts. Revered, now, as treasures. 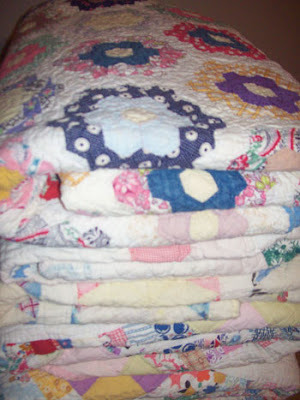 In the rubble that covered a lifetime's treasures - the quilts were the thing that needed saving. I never have quilted. Never made, with my hands, something so lasting or so deliberate. Utilitarian beauty - scraps transformed. Bright happy crafted from the ordinary. Made to be taken for granted. To be relied upon. Washing them seemed the least I could do - I had to do. It felt good to repay, in some small way, Dee, other quilters I have known, the quilts that have warmed me, and the rain. I am Dee. I am the one who is blessed with this overpowering kindness from Cat and Agatha. They are love in action, they are the hands and feet of God bringing blessings into an otherwise hopeless situation. When people say, "It's the least I can do," it seems to me they always are doing the one key thing upon which all else pivots. Those "least" actions or words are the seeds of hope and strength. You are my angels. I do not deserve such incredible gifts, but I receive them with joy and gratitude and prayers of thanksgiving. I love you. I am crying tears of joy (literally). Your words are beautiful and so are you! You have touched my heart. Update, should anyone come back here: In December, Dee came over under the pretense of delivering a small holiday something. I thought, "oh good. Cookies!" And she did deliver cookies. More importantly, she delivered quilts. One for each of my children for whom she didn't make a quilt - Annabeth and Patrick. The top one in the picture above for Pat, and another - appliqued. A thing of refined beauty. I am still so touched, so dumbstruck by this act. They are exquisite. Her generosity is boundless - to give things of such meaning and such history (one from each of her grandmothers.) I am blessed.